Most people understand that sugar causes teeth to get cavities. From an early age, dentists talk to kids about “sugar bugs” or sugar rotting holes in your teeth. Most people walk out of the dental office assuming that the more sugar that one consumes, the more likely one is to have cavities. This in turn leaves people assuming that dentists don’t want them to eat sugar. Dentists know that this could never happen, and don’t expect you to give up sugar and carbohydrates. Instead, we want you to eat sugars /carbohydrates less frequently throughout the day and clean your teeth after doing so. In order to understand why, we need to talk about how sugar causes cavities. Carbohydrates are an important source of energy in our diets. These carbohydrates are complex chains of sugars that are broken down in our mouths by our saliva (by an enzyme called amylase). These complex carbohydrates become simple sugars such as sucrose (table sugar). Our body needs these sugars, which are high in energy, to fuel activity, growth, and development. Our body is not the only thing that likes the fuel obtained from simple sugars. Bacteria that live in our mouth love these sugars too. One such bacterium is called Streptococcus mutans. S. mutans is just one of many micro-organisms in the mouth, however S. mutans is best known for its ability to ferment sugar (sucrose) into lactic acid. This acid eats aware at the hard enamel surface of the tooth causing cavities. For microscopic S. mutans, even a single sugar crystal seems like a huge meal. Much like humans and animals, a large meal causes them to produce by-products, which leave the body as excrement. For S. mutans, that by-product or excrement is lactic acid, which again eats away at the enamel of the tooth. Unfortunately, after lactic acid is produced, it hangs around for a while before the saliva in the mouth can neutralize it. Biofilms and plaque build up shield the acid from being neutralized by the saliva and its buffer system. Although enamel, the outer layer of the tooth, is the hardest substance in the human body, it has a major weakness. Acid is like kryptonite to the tooth. Over time, this weakness eventually breaks through the tooth’s hard armor shell. At a pH below 5.5, the enamel armor becomes susceptible to cavities. The lower the pH and the longer the pH stays low, the more quickly cavities can develop. Each time we eat a fermentable carbohydrate, the bacteria in our mouth produce acids. This drops the pH around the tooth from its normal neutral pH of 7 down to as low as 3.5. That’s more than 1000 times more acidic than normal. The pH stays low for about 15-20 minutes after each exposure of sugar. 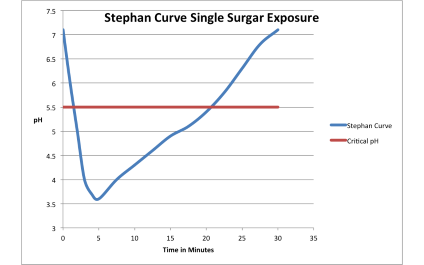 As we can see from the chart above, a single exposure to say a sip of sugar causes the tooth to be exposed to acid for 20 minutes. Now, let’s be generous to the next child and allow them to have as much soda or juice as their little heart can desire with breakfast and lunch, but nothing in between. So the point of this exercise is that the child having a single soda or sippy cup throughout the morning is going to have more cavities than the child that drinks as much as they want during breakfast and lunch. Therefore it isn’t the amount of sugar consumed so much as the frequency of sugar exposure. You can’t cut sugar out of the diet completely. But as a parent, make sure that your child is enjoying their candy or juice with meals and not frequently in between meals. Avoid gummy candies and snacks that can stick to the teeth and stay there, as this mimics constant exposure to sugar. Brush and floss regularly, help your child establish that routine. And most importantly, make sure that your child goes to bed with clean teeth. Children sleep over 10 hours a day ( varies by age group), and if you go to bed with clean teeth and only allow water after brushing, the majority of the day the teeth will stay clean and healthy. Finally, what happens when we let a child sleep with a sippy cup or bottle all night?